Courtesy of our friend and up-and-coming photographer, Joe Lu – I’m glad to be sharing the final pictures of our kitchen. It’s been the heart of the house throughly enjoyed through the many parties, get togethers and even cooking classes:) and I can’t help but feel lucky to be cooking in it every day. Don’t know what happened – the last post from 12.3 didn’t upload and ugh – I have to start all over again. 11/24/09 – Yay! Our Bulthaup kitchen has arrived! And so does the rest of our kitchen appliances including the fridge and dishwasher. 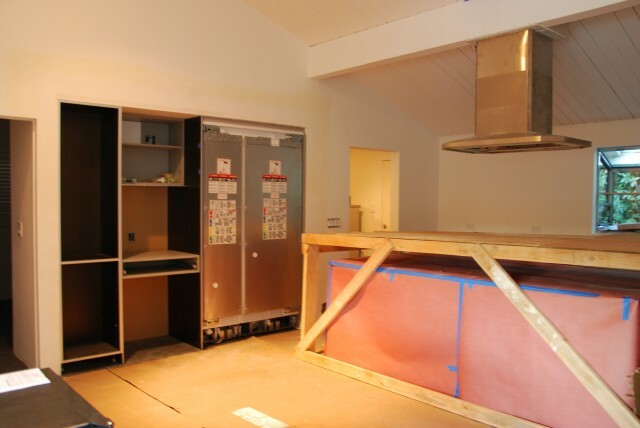 12/7/09 – Michelle from Bulthaup’s really concerned that the kitchen hood isn’t installed yet. I too think that Sean, our GC, is delaying the hardest project til the last. Little afraid. Start freaking out and urgently ask Sean to get going on the kitchen hood installation. Little tricky since it’ll be installed on a post and beam. Crossing fingers. Wow – a whole month’s already gone by and here’s the latest update on the progress. All of the plumbing and electrical have been squared away, the walls have been patched with new drywall and it’s almost ready for the floor tile to be laid and the cabinet to be installed. After going thru the “ugliest” stage, it’s finally starting to look much improved week after week. As of today, all of the extra debris has been cleared and Michelle from Bulthaup’s gone through the final measuring without much hiccup so I think we’re good to go. Some of the critical appliance from Thermador are on backorder due to their special promo (buy a fridge, get your hood free; buy a oven, get a dishwasher free or something like that) – which means that some of the installs will be stalled for the time being. Crossing fingers to move in soon even if it means cooking a la camping-style. Here’s the updated pic of our kitchen – TOTALLY torn up that it’s little scary. And to add a little drama – we stopped by the house over the weekend right when the plumber was on the kitchen floor digging and cutting through the slab. Of course, he accidentally cuts through some water pipe, where the water starts gooshing out all over the floor and he, in his little English-mostly-Spanish says, “Water? Stop!”…and none of us can figure out where the main shut off valve for the water is. After freaking out for what seemed like at least 20 minutes, his partner shows up, finds the main valve (which apparently is near the street) and all’s saved! For few minutes, we thought we were going to live in a soggy, swamp-land of a kitchen. Whew! 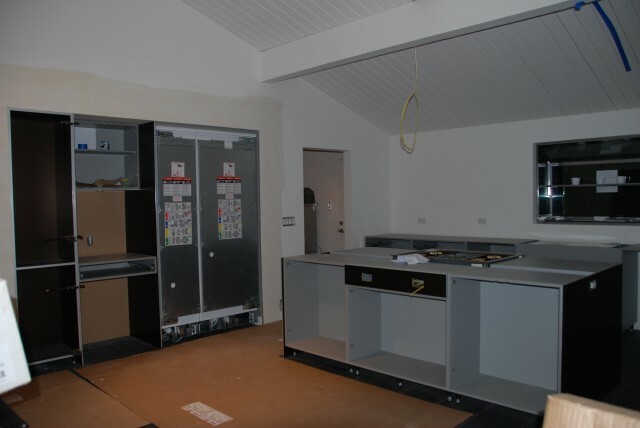 The New Kitchen will be equipped with amazing, to-die-for, and mucho moola-but-worth-it Bulthaup B3 kitchen. Given that the Euros go on their vacation in August, it’ll take a while b4 the cabinets are here, but it’ll be beauuuuutiful! It was the first one I picked out in the design magazines and the one we both fell in love with – the quality and craftmanship and timlessness, unlike some of the other trendy Italian kitchen designers…And our designers, Michelle & Gaby are meticulous and just plain awesome!!! Fun fact – while we were researching the vendors for the dream kitchen, I found some blogs that Brad Pitt has a Bulthaup too! Maybe he’s a closet cook too?! 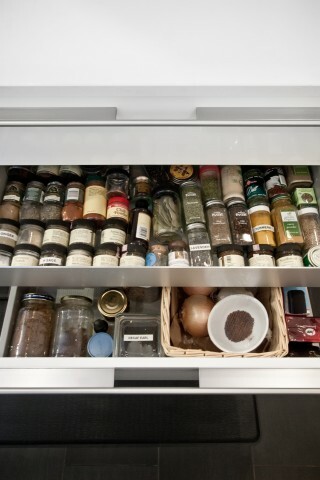 Also Emeril Lagasse, a legit cook – which is major props for our kitchen selection. And ya – I also heard that Eric Clapton has Bulthaup too…but dunno anything about him since his records days other than I like his music sometimes? August 6, 2009 – A fire at Dornbracht factory in Iserlohn, Germany. 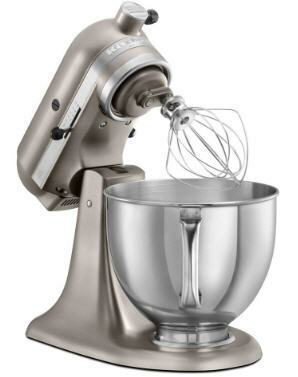 A possible long (another) hiccup in getting our plumbing fixtures….tbd. tabula rasa - a clean slate July 28th, 2009 - All the rubble is gone and we're starting with a clean slate. 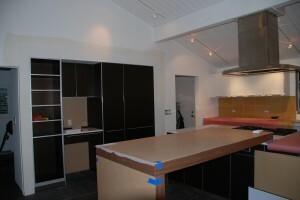 Bulthaup kitchen has been ordered and we're SUPER excited! All the fixtures have been picked out and we have some tile decisions to make. Who knew there were so many tiles to choose from? We did have a hiccup along the way - where initially, we wanted the floors to have a modern feel by having polished concrete floors. Unfortunately, the floors are not leveled well and it'd mean at least 1.5-2 inches of pouring concrete and then polishing it. A lot of work and way too $$$. Narrowed it down to porcelain tile that's easy to maintain and tough~ let the demo begin! 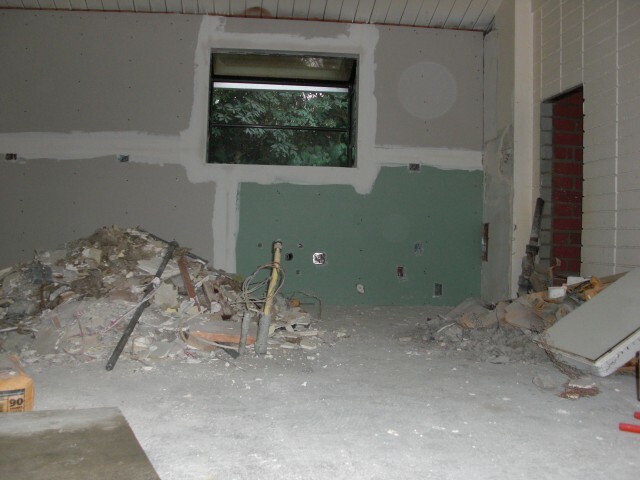 July 7th, 2009 – Let the demolition begin! The previous owner had awful, rickety cabinets with coats and coats of thick, old paint and acrylic cabinet pulls. 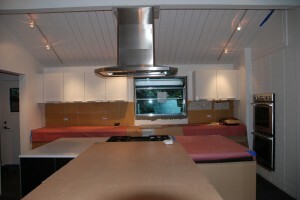 June, 2009 – Kitchen definitely needs a major overhaul. Closed off and not condusive for entertaining and cooking. Needs major update. Luckily, we were referred to Sean Icaza by our bestest friend, Jeff ^ ^ . 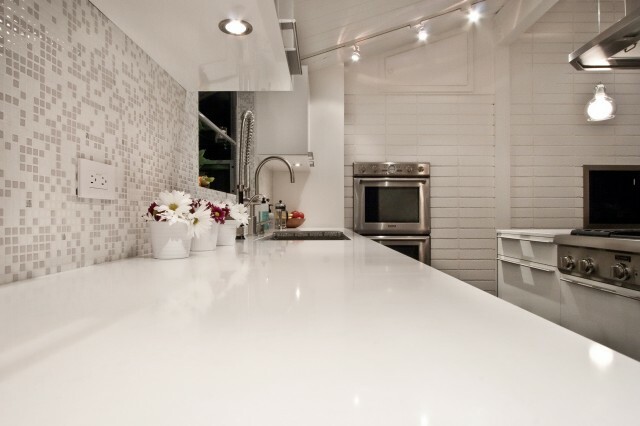 Sean, a veteran general contractor in South Bay, is one of those guys who really gets it, our clean and modern style. We just showed him some pictures of what we wanted, eg., polished concrete floors throughout the house, and it’s like “yup – i know how to get that done”. Getting another GC to check out our house was a bit of a nightmare when he started talking about textured paint that looks like leather (on the ceiling! ), and scratching his head when we mentioned concrete floors. We’re in good hands! Let’s just hope that things move smoothly and fast so that we can at least move into the house b4 fall! Sean rocks! Your kitchen is beautiful. It is simply beautiful. 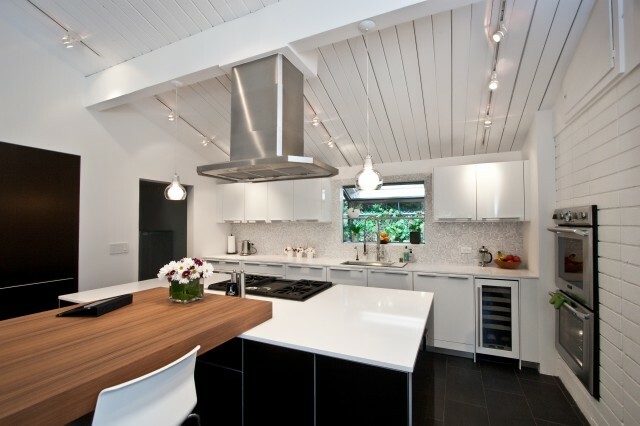 I love the clean lines, the large wooden counter top, the lighting design and the stainless steel hardware. 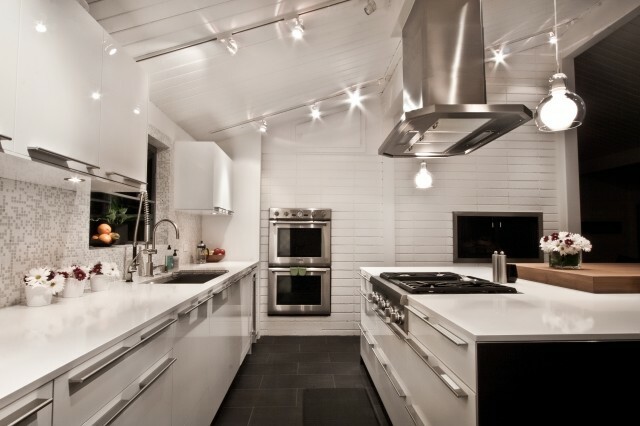 Also, the floor is a nice contrast that really makes the kitchen pop. It was probably a lot of work, but I’m sure it was well worth it!